Here at TV Lift Cabinets, the main priority of design is functionality, followed very closely by elegance. Oftentimes, the mechanical or sterile look of metal or particle board completely destroys the style of a room, despite the time and energy put into lighting and decorations. A big factor in the entertainment center as an eyesore is the ever-present nature of tv cables. 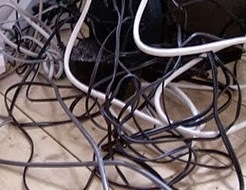 Many people consider wires to be unavoidable. They think you simply have to deal with wires if you want to have a TV in your family room. However, our TV Lift Cabinets are designed to conceal wires so that the aesthetic of our furniture is maintained. Many of our cabinets have vintage or retro styling that would be marred by unsightly cables. In addition, many of our cabinets are specifically designed to accommodate your speakers or soundbar, including running the wires between external audio devices and your receiver or television. Many even have interchangeable speaker cloth for the front portion of the cabinet (to provide maximum sound quality). And of course, in each of our storage TV lift consoles, we offer an Infrared Relay System. This is a feature that allows you to use your regular remote through the wood of the TV cabinet. This way, not even the infrared remote receiver will need to be visible. With one of these cabinets, you can finally say “goodbye” to cables from your tv.